The ideal 3-D TV watching experience should be effortless. Walk into a room with a functioning 3-D TV, and the 3-D content is visible for all to see, no glasses required. Today’s technology isn’t quite there, but a giant glasses-free 3-D display that Japanese researchers have recently developed brings us one step closer. 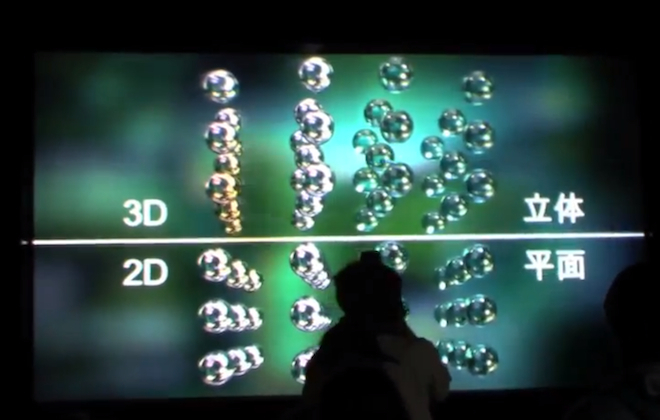 Japan’s National Institute of Information and Communications (NICT) and JVC Kenwood teamed up to develop a massive, 200-inch glasses-free 3-D display. They’re claiming it’s the largest auto-stereoscopic full HD 3-D display in the world. The display’s glasses-free 3-D effect is created using an array of 57 projectors, each one specially tuned to display the correct brightness and color levels. A condenser lens focuses the light to create a sharp image, and a diffuser film is used to create a smooth transition as the viewer switches. The setup weighs over 1,100 lbs. For perspective on the size of this beast, most consumer-designed big-screen HD TVs tend towards the 65- or 55-inch range at the large end. On the complete opposite end of the spectrum, an IMAX screen is traditionally 864 inches (72 feet). Unlike other types of 3-D displays which tend to have viewing angles around 180 degrees, the viewing angles for the display are a scant 13 degrees. This means that if you look at the image from the right or left edges, you’ll see the on-screen image from different angles. So if you were looking at an image of, say, a box, you’d be able to see the side edges of the box from within that viewing angle. As far as home theater-friendly 3-D TVs go, many consumers aren’t taking the bait. However, most consumer-focused 3-D TVs still require you to wear a pug fugly pair of 3-D shades. We’re starting to see more glasses-free 3-D options become available — like Toshiba’s recent notebook offering and the Nintendo 3DS — but we haven’t seen the technology take off quite yet. Though this 200-inch display could fit on a large wall in your home in theory, the team sees the technology being used in digital signage (billboard-like advertisements) and design applications. The team is currently working on developing 3-D video capture, which should be ready in the near future. They have to film video using cameras placed at 0.78 inch intervals, and since regular HD cameras are so large, that’s not possible (they’d bump into each other at that proximity). CG video, however, is not an issue, as the video below demonstrates. Future versions of this display will have 200 viewing angles, otherwise known as parallax images, instead of only 57. Check out the video to see this giant 3-D display in action.